Riverdale has a wide range of different wall clocks. 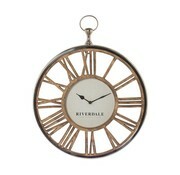 With a wall clock from Riverdale you create an eye catcher in your decor. The different clocks are available in the large and small. So you can easily choose the right size that fits you best. A wall clock is, of course, not only to read the time on. A wall clock is an indispensable piece of decoration in your home! The wall clocks are made of different materials. From wood to iron, from chic to rustic. 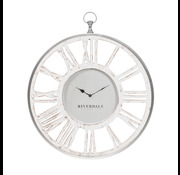 Most large clocks are also available in a Riverdale table clock variant. So you can have multiple clocks in the house with the same atmosphere. Use a large Riverdale wall clock on a bare wall with a painted track on the wall. To break the long blank wall, and feel immediately cozy! Do not be afraid to choose the size, go for big! A Riverdale clock is also ideal in the kitchen. So you can keep an eye on the time cooking! There are several clocks in smaller sizes for a smaller kitchen, of course you can also use a table clock.